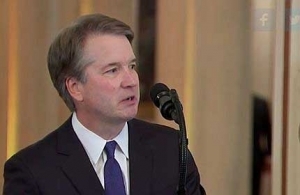 “President Donald Trump’s latest pick for the Supreme Court, Judge Brett Kavanaugh — a Catholic, whose appointment preserves the Catholic majority on the Supreme Court — will shift the high court dramatically to the right, most noticeably when it comes to religion. According to their Judicial Common Space scores (a method of measuring justices on a left to right, liberal to conservative scale), Kavanaugh is more conservative than Samuel Alito and Neil Gorsuch, meaning he’s more conservative that even the late Justice Scalia. This seismic shift to the right will perhaps be most obvious on matters of the separation of state and church. Ensuring the secular character of the government is not a panacea, but it’s pretty close and it touches on a host of progressive issues including reproductive rights, the environment, immigration, health care, education, and so much more. Two of Kavanaugh’s recent opinions illustrate the damage he’s likely to cause. Last year, he wrote a glowering dissent arguing that forcing a 17-year-old immigrant to continue to carry her pregnancy was not an ‘undue burden.’ Two years before that, he wrote another dissent arguing that filling out a five-blank form is a ‘substantial burden‘ on the religion of a Catholic group called Priests for Life, one of the countless groups seeking to undermine the Affordable Care Act’s contraception mandate. “The conservative social positions religion takes in the culture war are costly. Religion, and especially conservative religion, is losing ground in this nation. It’s losing ground and the debate on religious discrimination, marriage equality, abortion rights, and countless other issues. While support for Trump among white evangelical Christians is at an all-time high, poll after poll show people leaving the churches and the ranks of nonreligious Americans swelling. Barna, a religious polling outfit, recently found that 21 percent of young Americans are either atheist or agnostic.